Always make a good impression on your photos, sketches, art cards, or other works can be decoratively marked with your name and copyright symbol. Rubber stamp can be optionally be ordered as self-inking model. SELF-INKING OPTION: Ergonomic SI-30 self-inking unit features smooth, Slide-n-Glide cam mechanism, a soft rubber case for a sure grip, and non-skid rubber feet. for photo papers. For fast-dry ink options, please call. Please Note: Specify name to be engraved on stamp below. Space is limited - names longer than shown in the example must be reduced in size to fit. Keep names as short as possible, else reduced size may cause name to be difficult to read. 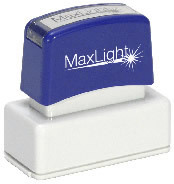 Unless ordering the self-inking model, this rubber stamp requires a separate stamp pad. 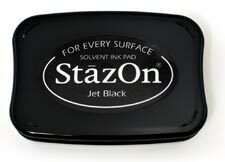 Use any of the StazOn ink pads for fast dry results on all photos. Most custom rubber stamp orders ship within 24 hours!